Stefan Dramiński. 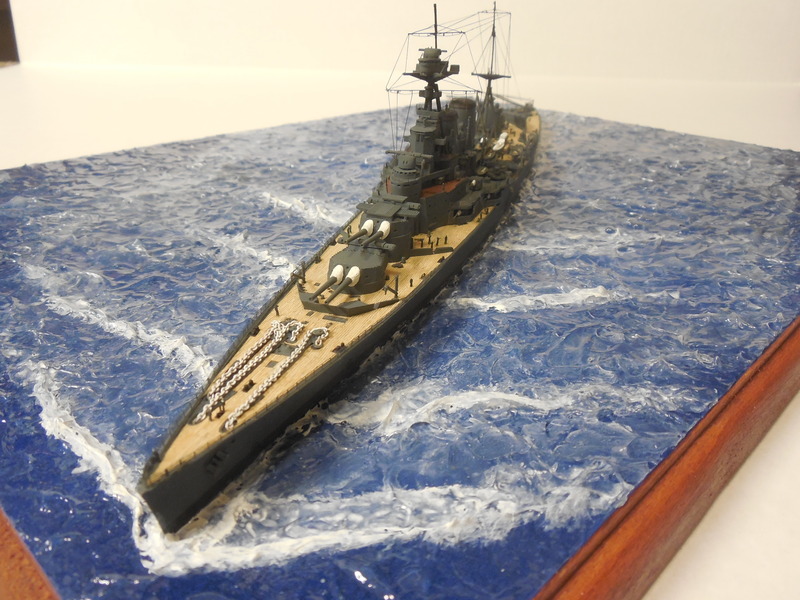 Super Drawings in 3D: The Battlecruiser HMS Hood. Lublin, Poland: Kagero Publishing, 2013. Steve Wiper. 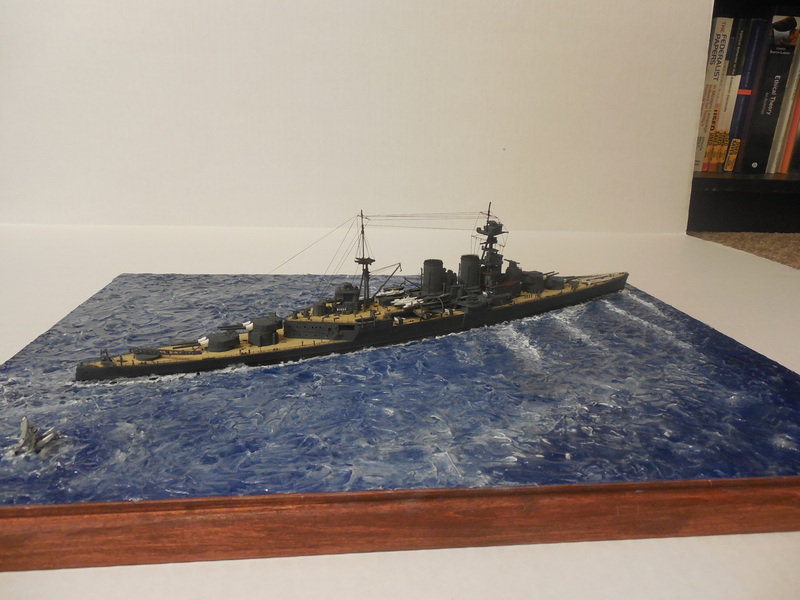 Warship Pictorial #20: HMS Hood. Tucson: Classic Warships Publishing, 2003. HMS Hood is most often seen modeled as she appeared at the time of her loss in battle at the May 24, 1941 Battle of the Denmark Strait. 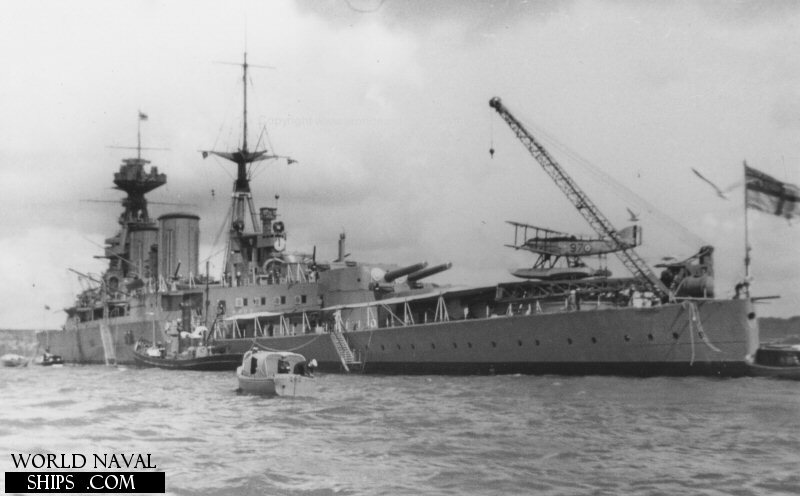 Trumpeter has fortunately (and rightly) assumed that a market existed that wanted an earlier version of the ship molded as well, resulting in their “HMS Hood, 1931″ kit in 1:700. This particular choice of eras is an interesting one, as Hood underwent numerous refits during her 21-year career and only appeared as depicted here for the year spanning summer 1931-fall 1932. This limits the modeler somewhat in their choice of subjects, but provided excellent fodder for my desire to model a particular moment in Hood‘s service life: her failed launch of a floatplane on June 26, 1931. Trumpeter’s kit provides clean and crisp molding along both primary and secondary structures. 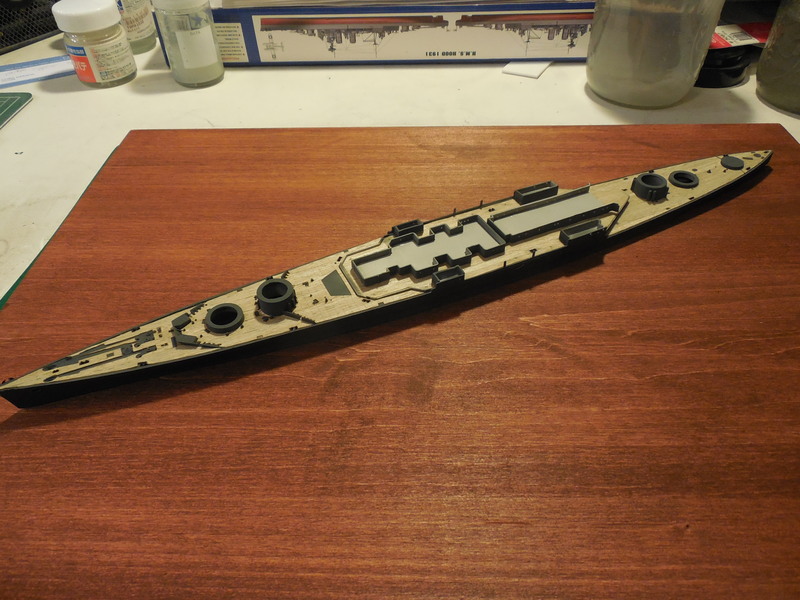 As some parts are holdovers from the company’s molds of the 1941 Hood (the hull and aft superstructure stand out as the most obvious examples of this), a bit of scratchbuilding is necessary for the modeler concerned with such details as the ship’s degausing cable or splinter shields. 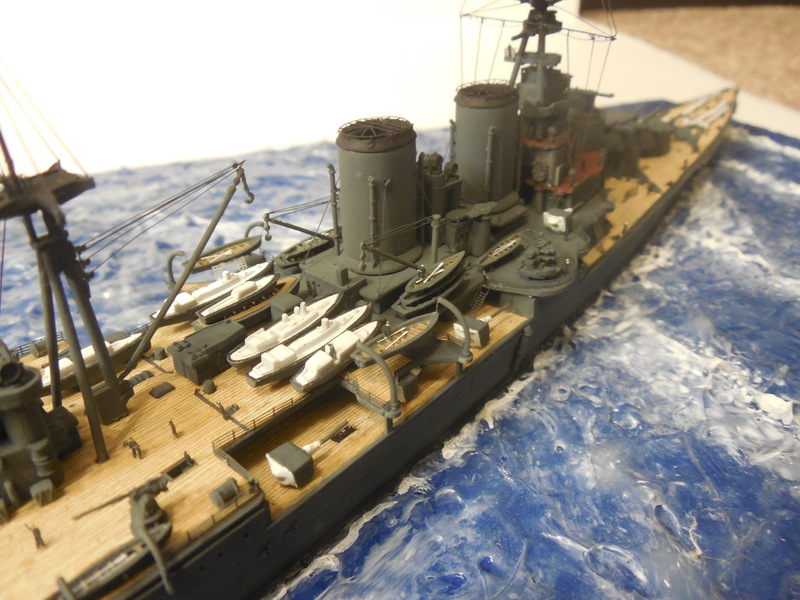 A complete, accurate, and realistic listing of these issues can be found on the website of the HMS Hood Association – they even have a comprehensive and detailed modification page designed for picky builders like myself. Any details that would benefit from improvement find this readily with PE sets by Gold Medal Models and Tom’s Modelworks; the addition of laser-cut wood decks by Wood Hunter take the kit to another level, though, and I now can’t fathom doing a ship with significant amounts of exposed wood without an aftermarket deck set. With this kit, I wanted to fashion my own ocean base from scratch. By using Liquitex Gloss Gel, Vallejo paints, and levels of patience I didn’t know I possessed (“you mean I can’t touch it for three days? !”) I was able to create a base with which I’m really quite happy. My next build will use a similar technique, but I do plan on doing more research on fluid dynamics before tackling the waveforms on that future kit. For a better description of the ocean-making technique I used, you can find a full review here! For once, there were no major problems when undertaking this build (except for the time my cat nearly destroyed the ship’s rigging job). I did spend an inordinate amount of time scratchbuilding most of the ship’s conning tower, but that was also a learning experience: I’d never extensively used styrene before this build , so I got through a lot of the growing pains one must endure when coming to grips with this modeling tool. Small accuracy issues aside, this kit was a pleasure to build. Were I starting it now instead of nearly a year ago, it may well have turned out better. But that’s what learning experiences are for, right? Overall, this was a pleasant, easygoing, and rewarding way to model one of history’s great warships. You can follow the build step-by-step here, here, and here, and you can find a full photo gallery of the finished build here!